The Humane Society of Missouri Animal Cruelty Task Force was stunned by the condition of the animals they rescued recently. It seemed as though desperate, emaciated animals were everywhere on the property just north of Vienna, Missouri. for some, it was already too late. 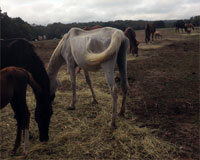 Multiple horses and other animals had already died from neglect. Working in cooperation with the Maries County Sheriff's Office and the Missouri Department of Agriculture (MDA), they rescued 40 dogs, rabbits, horses and goats. Many of the animals are severely underweight and have had little access to food, fresh water, adequate shelter or veterinary care. The water available to the dogs was contaminated with urine and feces. A recently deceased horse and multiple carcasses were found on the property. The animals were removed at the recommendation of a veterinarian for the MDA. Mango, a white mare, was so thin every rib and hip bone can be seen. Her sunken body was covered in rain rot, a skin infection that had become severe from lack of veterinary care. And she wasn't alone. She had a foal who was also starving to death. Too malnourished to produce milk, Mango was unable to care for her baby. Mango and foal, along with the other rescued horses and goats were transported to the Humane Society of Missouri's Longmeadow Rescue Ranch in Union, MO. There they are receiving emergency veterinary care. The rescued rabbits and dogs, which include adult and newborn Beagles, Terriers, and Great Pyrenees have been taken to the HSMO headquarters in St Louis City. They are being treated for parasites, eye infections, and malnutrition. If custody is awarded to the HSMO, as many of these animals as possible will be made available for adoption. A disposition hearing is scheduled for October 2 in Vienna, MO. The HSMO will be recommending animal abuse charges in this case. P.S. - Thanks for your kind comments of Fred. Our vet did mention water therapy, but we have no where around us and it would be too costly for us to take him elsewhere. This makes me sad and angry. Why must people continue to do this? So horrible to read about cases like this. It's happening all the time, all over, and it can get quite overwhelming. Thanks to all the many wonderful caring people who help. And thanks for stopping by my blog today! Horrible - agreed. Happening all the time and all over - unfortunately, I agree with this, too. Of course, I cannot explain this specific incident. However... the economy and the drought here in our area are a combination that is tragic for animals. Many folks here have sold off their herds due to the severe drought. No hay; no pasture. Then there are those other folks. In this case, I suspect they had a puppy mill. I'm just glad someone reported them and these animals got a second chance at a good life. Mom's horrified reading this. OMD, how awful humans can be. Thank goodness for the humans who rescue. We understand economic times and weather issues for sure, however, there are humane ways of dealing with hardship. This is just awful Sue. Animals have a better chance to survive in the wild compared to this scenario. I do hope they find the person responsible for this.